Welcome to the All-Star Summer Showdown II Event! 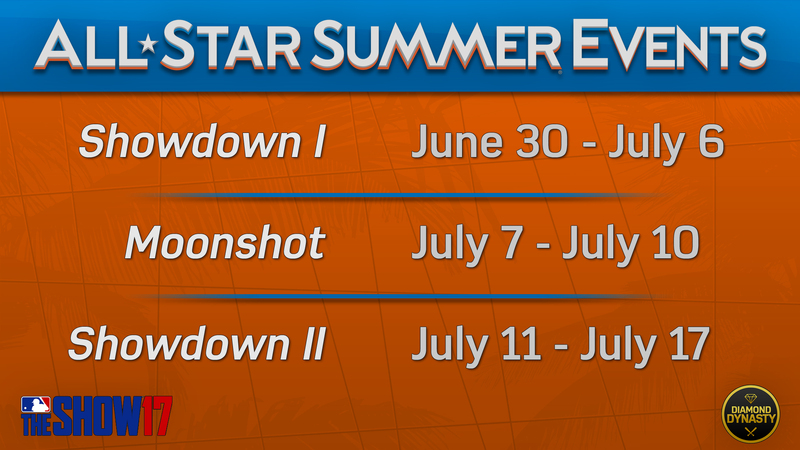 The seventh Diamond Dynasty event in The Show 17 will be the All-Star Summer Showdown II Event. Assemble a team of only National League pitchers and American League hitters. The All-Star Summer Showdown II Event consists of only 3-inning games. The reward system is similar to Battle Royale in Diamond Dynasty where you collect rewards as you pass win-streak reward milestones and rack up wins during a single entry. There is also a cumulative wins reward for racking up those wins over the course of the Event. Q: If I win 12 games in the same Event entry, do I get the 3, 6, and 12-win streak rewards? Q: Do I have to win 12 games-in-a-row without losing to get the Streak reward? A: No. Similar to Battle Royale, you can earn the 12-win reward even if you lose once during the entry. Your streak wins will reset after Double Elimination.